Synopsis: Don't be left in the dark! PIAA Xtreme White Plus H7 Light Bulbs combine technology, quality and style to enhance a vehicle’s lighting system and help make night and inclement weather driving as safe as possible. Kelvin rating of 4000K for a cool white nearly blue color. 55watts per bulb put out 110 watts total. PIAA Xtreme White Plus driving light bulbs project a brilliant cool white light that comes very close to the color of expensive High Intensity Discharge (HID) lighting systems. 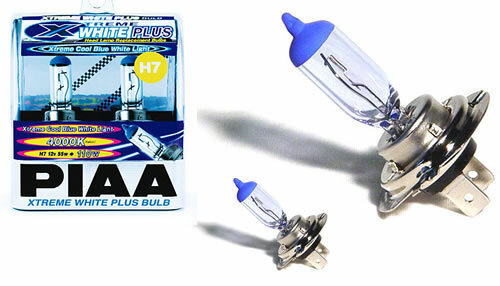 Xtreme White Plus headlight bulbs feature PIAA Xtra high efficiency design that produces greater light output than their rated power consumption (for example, a bulb that consumes 45/65W of electricity has a light output that is similar to most 95/120W bulbs). Sold as a set of two bulbs Fits any light application that uses a H7 bulb. Please note, this bulb fits numerous vehicles including the MINI. However, the Gen1 and Gen2 MINI models use different light types in the various bulb locations. Please confirm with the user manual in your MINI to confirm what bulb type is required before ordering.